Full color 9" x 13" ad for their Cigarettes. The ad has a photo of a man playing a piano and pausing to speak to a woman in a rose-colored dress who is leaning on the back of his piano while smoking a Lucky Strike. The headline calls it "Gentle on Your Throat" and offers "One reason a Light Smoke is better for you". It claims that it will "Keep your throat clear...your voice clear" and claims that being Toasted is what keeps the "harsh irritants naturally present in even the finest tobacco" out of Lucky Strike. They claim to be "kind to your throat, gentle when you inhale, better for you in every way". Full color 9 3/4" x 13" ad with a large photo of Independent leaf buyer, Andrew Wright showing a tobacco leaf to an interested lady. The ad headline has him claiming "I keep track of who pays what". This ad is larger than my scanner bed so the outer edges of the ad are not visible in the scanned view. Full color 9 1/2" x 13 1/2" ad with a photo of Tobacco Warehouseman J. M. Talley showing a dried tobacco leaf to a lady in a green suit. The ad headline let's us know that "Lucky Strike means fine tobacco". This ad is larger than my scanner bed so the outer edges of the ad will not be visible in the scanned view. Full color 10" x 12 1/2" ad features the painting Outside the Curing Barn by Thomas Hart Benton. This ad is larger than my scanner bed so the outer edges of the ad will not be visible in the scanned view. Full color 9 1/2" x 13 1/2" ad that reminds us tht "In a cigarette, it's the tobacco that counts". 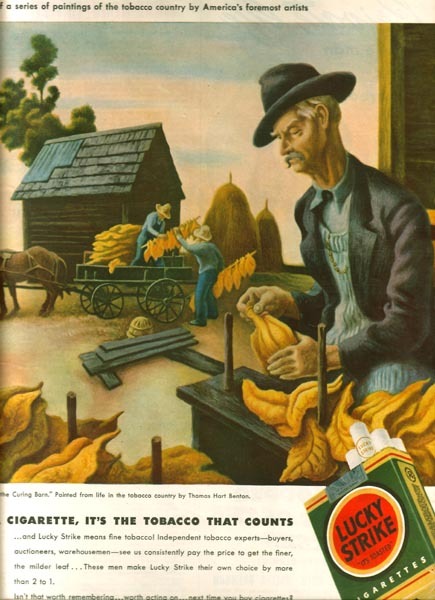 The ad has a picture drawn by Thomas Hart Benton entitle Tobacco that shows large leaves of tobacco drying in the sun as the farmer is seen in the background helping his horse pull a wagon. The text claims that tobacco buyers, auctioneers and warehousemen choose Lucky Strike by a 2 to 1 margin and you should too. Full color 10" x 14" ad with a picture of another older man who is standing with his back to us examining a golden leaf of tobacco. The ad has him saying "Man, that's fine tobacco" and the ad reasons "...that;s Lucky Strike tobacco!" It then reminds us that "Yes, Lucky Strike means fine tobacco"
Full color 9 1/2" x 12 1/2" ad with a picture of a broad shouldered young man standing in a field of tobacco while holding a giant leaf in his hands for examination. 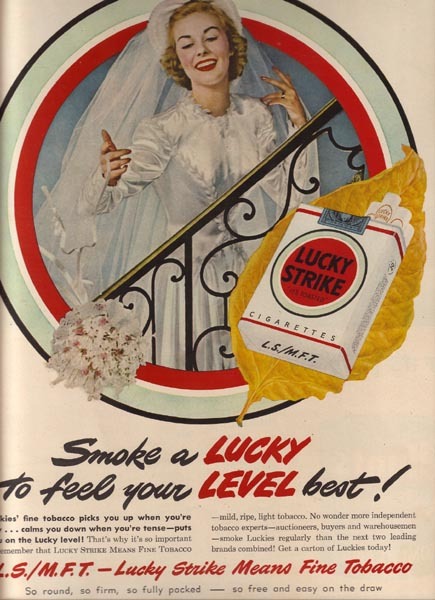 This picture has been used in other Lucky Strike ads with different text. At the top of this ad are the words "Defend the Constitution" and the insignia "For Victory Buy United States War Bonds and Stamps". At the bottom of the ad are the words "You said it! L.S./M.F.T.". This ad is larger than my scanner bed so the outer edges of the ad will not be visible in the scanned view. Full color 9 1/2" x 12" ad has a drawing of a farmer with wide shoulders standing in his tobacco field holding a golden tobacco leaf up for inspection. The ad headline reminds us that the "Quality of Product is Essential to Continuing Success. L.S./M.F.T." This ad is larger than my scanner bed so the outer edges of the ad will not be visible in the scanned view. Full color 9 1/2" x 13 1/2" ad that reinforces the notion that Lucky Strike cigarettes were filled with "Fine Tobacco". There is a painting entitled Sticks' of Fine, Ripe Tobacco done by George Schreiber that shows a man carrying two wooden poles that have a lot of tobacco leaves tied to them in the process of drying. He is walking toward a building while, in the background, two other men are examining a tobacco leaf for quality. There is a picture of an opened pack of this product with the words claiming "Light tobacco, Ripe tobacco, Mild tobacco" next to it. Full color 9 1/2" x 13 1/2" ad that reminds us that "Fine Tobacco is what counts in a cigarette". There is a reproduction of a painting by Frederic Taubes that is entitled Grading the Harvest that shows a hard-working couple quietly sorting through the leaves of dried tobacco. The ad contains testimonials from three knowledgeable tobacco men who speak of the quality purchases that the makers of Lucky Strike cigarettes historically make. The phrase at the bottom of the ad calls this cigarette "So Round, So Fine, So Fully Packed - So Free and Easy on the Draw". Full color 7 1/2" x 10 3/4" ad that tells us that the reason that their cigarettes are so good is because they always buy the Best Tobacco. There is drawing of a perfect tobacco leaf with the image of a smiling lady holding a lit Lucky Strike. Below this is the headline "Lucky Strike presents The Man Who Knows - The Tobacco Auctioneer". In the text under this there is a quote from J.M Ball about how, in his experience, the buyers for Lucky Strike always seem to buy the best tobacco. Full color 10" x 13" ad shows a bride on a stairway throwing the bouquet. The headline tells you that you should "Smoke a LUCKY to feel Your LEVEL best!" This ad is larger than my scanner bed so the outer edges of the ad will not be visible in the scanned view. Full color 9 1/2" x 12" ad has a photo of Independent warehouse operator Dan Currin holding up, for your inspection, a quality leaf of tobacco. The ad headline claims that "Luckies Pay More to give you a finer cigarette!" This ad is larger than my scanner bed so the outer edges of the ad will not be visible in the scanned view. Full color 9 3/4" x 13 1/2" ad shows actress Marlene Dietrich sitting on a couch with her Lucky attached to a cigarette holder. The ad headline has her saying "I smoke a cmooth cigarette - Lucky Strike". This ad is larger than my scanner bed so the outer edges of the ad will not be visible in the scanned view. Full color 9 3/4" x 13" ad has a photo of Phil Harris lying on an outdoor lounge chair having his Lucky lit by Alice Faye. The ad headline claims that "Scientific tests prove Lucky Strike milder than any other principal brand!". This ad is larger than my scanner bed so the outer edges of the ad will not be visible in the scanned view. Full color 9 3/4" x 13 1/2" ad with a Christmas-time drawing of a car filled with the Lucky Stars, the TV and Radio stars of the day who were sponsored by Lucky Strike cigarettes. The ad headline has them wishing you "A Happy Christmas and a Lucky New Year!". This ad is larger than my scanner bed so the outer edges of the ad will not be visible in the scanned view. Full color 9 1/2" x 13 1/2" ad for their Mild cigarette. The ad has the headline of "Be Happy - Go Lucky" and has pictures of three people that are doing just that. The largest picture is of a lady in a green dress with a crown who is at the Mardi Gras in New Orleans. There is another picture of a lady smoking away while she rides up on a ski lift and a picture of a man wearing the garb of a Shakespeare player smoking as he recites his lines and sweeps out his arm. This ad is larger than my scanner bed so the outer edges of the ad will not be visible in the scanned view. Full color 9 1/2" x 13" ad for this popular brand of cigarettes. The ad has several drawings, including the biggest one of a causally dressed lady who is fishing with a stick and a can of worms and has caught more and better fish than a man using the latest and greatest of fishing gear. The ad headline encourages you to "Be Happy - Go Lucky". This ad is larger than my scanner bed so the outer edges of the ad will not be visible in the scanned view. Full color10" x 14" ad for the fact that "Luckies taste better than any other cigarette". The ad has a picture of a man playing golf and he stands looking down at a friendly black dog. He is sitting there reciting a poem that goes this way. "For once I hit a good shot, then (pause)This pooch picks up the ball (pause) But I am smoking Lucky Strike (pause) So I don't mind at all". The headline for the ad is "Be Happy - Go Lucky". The first line in the text is that "Fine tobacco - and only fine tobacco - can give you the perfect mildness and rich taste that make a cigarette completely enjoyable". In the lower third is another drawing of a lady in uniform sitting in front of a typewriter and she gives forth with this poem. "My job is typing all day long (pause) At Treasure Island Base (pause) Where Luckies are the favorite smoke (pause) You see them every place". Full color 9 1/2" x 13" ad has a drawing of a lady dressed in a red suit and a serviceman who are staring at the back end of their car which now has shoes tied to the bumper and a sign that says "Be Happy - Go Lucky". This ad is larger than my scanner bed so the outer edges of the ad will not be visible in the scanned view. Full color 9 1/2" x 13" ad with a picture of a lady in a purple bathing suit at the beach with her 'man'. She has just come out of the water and he, while kneeling by their picnic basket, is offering her a Lucky Strike cigarette. The ad headline claims that "Luckies taste better than any other cigarette!". This ad is larger than my scanner bed so the outer edges of the ad will not be visible in the scanned view. Full color 8" x 10 3/4" ad for their Better Tasting Cigarettes. There is a picture of a lady who is tearing the seam of the paper of one of her Lucky Strike's to expose the tobacco. The headline asks you to "Now see for yourself why Luckies Taste Better" and the text claims that if you do this to a Lucky Strike and to other cigarettes that you may have smoked the difference will be very obvious. It describes several methods to tell good tobacco from so-so tobacco. Full color 7 1/2" x 10 1/2" ad for the Christmas cartons of Lucky Strike. The ad has a picture of a carton, with the words "Merry Christmas" emblazoned on the side, lying on a bed of pine cones, evergreen branches and some assorted Christmas decorations and a tag that says "For a Lucky Christmas and a Happy New Year". The caption under the picture urges you to "Give cartons of Luckies this Christmas! Luckies taste better...cleaner, fresher, smoother!" Full color 9 1/2" x 13" ad for their Cleaner, Fresher...Smoother Cigarettes. The ad has a picture of a couple, showing just their heads, smoking cigarettes while the woman is holding a tennis racket under her chin. 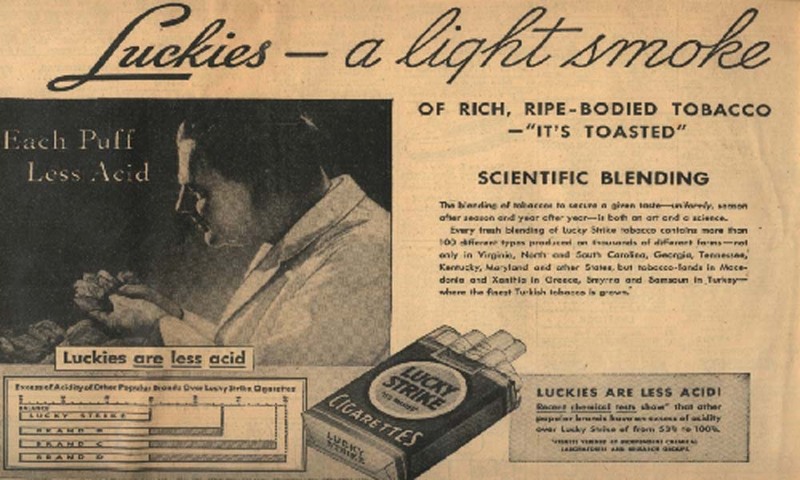 The ad headline claims that "Luckies Taste Better!" and that "Nothing - no, nothing - beats better taste!". This ad is larger than my scanner bed so the outer edges of the ad will not be visible in the scanned view. Full color 8" x 11" ad for the Taste of Luckies. The ad has a picture of a lady with a lit Lucky Strike in one gloved hand yelling while she holds a rolled-up program in her other hand. There are three small drawings of cheerleaders cheering next to the words "Cleaner, Fresher, Smoother!" and the headline claims that "Luckies taste better. Nothing - no, nothing - beats better taste!". The text talks about smokers being "bombarded with so many reasons for smoking so many brands of cigarettes" but assures us that the only valid reason for smoking a cigarette is enjoyment. Black and white 7 1/4" x 10 3/4" ad for the Taste of Luckies. The ad has a picture of Noted Designer Lily Dauche who tells a story of a Texan that she once met who talked to her about taste and about Lucky Strikes. The ad headline reminds us that "It's all a matter of Taste. Luckies taste better". Black and white 7 3/4" x 10 3/4" ad with Ted Williams. The ad has several photos of the baseball superstar involved in one of his favorite hobbies, fishing. The first photo shows him having hooked a battling bonefish using one of the rods that his company produced. The second picture shows him proudly holding up the fish he caught off the Florida Keys. In the third picture he is relaxing with a Lucky Strike and a smile. The ad headline calls this a "Lucky day for Ted Williams" and the text talks about the fact they are toasted helps make them taste better, both outdoors and indoors. Black and white 7 1/2" x 11" ad that tries to convince you that when it's light-up time, it's time to "Light up a Lucky". The ad has a picture of a couple lying on the floor in front of a fireplace that is starting to run low on logs and a clock superimposed in the upper left corner of the picture shows that it is just about midnight. They look sleepy and are sharing the last cigarette of the day, a Lucky Strike of course, before calling it a day. The text mentions several times that it is better because It's Toasted and that it is Cleaner, Fresher, Smoother!. Black and white 9 1/2" x 13" ad for the cigarette that is better because It's Toasted. 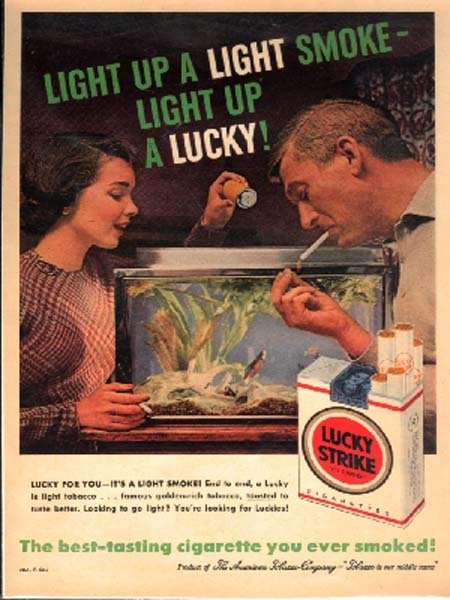 The ad has a picture of a man who is busy putting up the storm windows and his wife has stopped him to light the cigarette he is holding in his mouth. The ad headline calls this "The best-tasting cigarette you ever smoked". This ad is larger than my scanner bed so the outer edges of the ad will not be visible in the scanned view. Full color 9 1/2" x 12" ad that shows just how easy Christmas Shopping can be. The ad contains a photo of a couple sitting around their Christmas Tree with nearly all of their presents opened. With just a few packages left to unwrap there are, at least, twelve cartons of Lucky Strike cigarettes that have been unwrapped. The ad headline tells you "This Christmas give cartons of Luckies." This ad is larger than my scanner bed so the outer edges of the ad will not be visible in the scanned view. Black and white 9 1/2" x 12 1/2" ad that shows how to have summertime fun. The ad has a photo of a lady in a white bathing suit kneeling at the edge of a swimming pool handing a cigarette to a man in the pool who is holding onto the ladder. The ad headline says "Light up a Lucky - it's light-up time!" This ad is larger than my scanner bed so the outer edges of the ad will not be visible in the scanned view. Full color 7 1/2" x 10 1/2" ad that tries to answer all of your questions about what to do for Christmas. The ad has a picture of a couple standing at a Bus Stop holding Chrisatmas decorations, a bag full of items and cartons of Lucky Strike cigarettes. There are several smaller pictures of this couple in action with the captions "Give Luckies", "Serve Luckies" and "Enjoy Luckies". There is a tag on a Merry Christmas carton of Luckies that has the phrase "Light up a light smoke - Light up a Lucky!". Full color 9 1/2" x 13" ad for the manly taste of Lucky Strike. The ad has a photo of two Firemen working on washing one of their fire engines. They are each smoking a Lucky Strike and one man is working on scrubbing while the other man is hosing down the front tire. The ad headline encourages you to "Get the honest taste of a Lucky Strike". This ad is larger than my scanner bed so the outer edges of the ad will not be visible in the scanned view. Full color 9 1/2" x 13 1/2" ad that calls your attention to the Taste of a Lucky Strike. The picture shows an attractive lady with a very satisfied smile on her face as she holds her lit Lucky Strike between the fingers of the hand she is resting her chin on. The headline asks you if you "Remember how great cigarettes used to taste?" before confidently assuring you that "Luckies still do". The ad also claims that these cigarettes contain "Tobacco and Taste Too Fine to Filter". Full color 9 1/2" x 13" ad for the Great Taste of Luckies. Pictured in the ad are two men at the top of a hill ready to start skiing. They are facing several slalom poles as one man has his goggles in place and is leaning in anticipation of the start gun. The other man is relaxing and waiting his turn by smoking a Lucky Strike cigarette. The headline asks "Remember how great cigarettes used to taste? Luckies still do." and it is suggested that you "Change to Luckies and get some taste for a change." Full color 10" x 13" ad that has a picture of football star Frank Gifford sitting in a big easy chair looking at a yearbook while he is smoking a Lucky Strike. The headline in this ad is asking you to "Remember how great cigarettes used to be? Luckies still do". This seems to be Frank's favorite spot for reading, surrounded by trophies, pictures on the wall and a pack of Lucky Strike seeming to be attached to the wall. The ad identifies Frank as being a former All-Pro halfback for the New York Football Giants for fifteen years. He is also identified as being a Lucky Strike smoker and remembering from his first cigarette to the one smoked in the attached ad how they deliver "that full, rich tobacco taste". Full color 9 1/2" x 13 1/2" ad for the cigarette that has "the taste to start with...the taste to stay with". As a tribute to this being a manly cigarette, Frank Gifford is endorsing this product. There is a black and white photo of Frank in 1957, already a smoker of Lucky Strike, running the football. There is another picture in color showing him sitting and relazing with a book and a Lucky Strike. The text has him saying that he started smoking Luckies because of the taste and he still does for the same reason. Black and white two-page 19" x 13" ad that describes Lucky Strike as being a cigarette for Men, successful Men. The first page has a picture of a smiling man in racing coveralls still wearing a helmet with goggles pulled up as he holds a racing car trophy in his hands and a Lucky Strike between his lips while a group of excited men crowd around him. The ad headline on this page tells us that "Lucky Strike seperates the men from the boys...". The second page shows this same man with the helmet and goggles still on his head, still holding the same trophy but with the Lucky Strike between his fingers. And, in a desireable change of pace, he is being crowded closely by an attractive dark-haired woman with the headline relieving us by claiming "but not from the girls". Both pages of this ad are larger than my scanner bed so the outer edges of the ad will not be visible in the scanned view. Full color 10" x 13" ad has two photos of a man smoking Lucky Strike The top photo shows a man hard at work driving a bulldozer and the bottom photo shows this same man, clean shaven and wearing a sport coat while being driven somewhere by an attractive young lady in her convertible. The as headline assures us that "Lucky Strike separates the men from the boys...but not from the girls." This ad is larger than my scanner bed so the outer edges of the ad will not be visible in the scanned view. Full color 10" x 13 1/2" ad with the picture showing a man, his chin, lip and nose, holding a full Lucky Strike in his mouth with a lit match just an inch away. The headline of this ad are two words, "Big meeting!". The ad text says that "When match meets cigarette, taste is the big thing. So Luckies are made for taste and taste alone. The tobaccos are selected for taste. Aged for taste. Blended for taste. It's hardly surprising then, that millions of smokers swear by Lucky Strike because of that taste". Full color 9 1/2" x 12" ad for this popular brand of cigarettes. The ad has a very close-up photo of a man who has an unlit Camel in his lips and a lit match about to make a connection. The ad describes this as a "Bullseye!". This ad is larger than my scanner bed so the outer edges of the ad will not be visible in the scanned view. Full color 9 1/2" x 13 1/2" ad for the Taste of a Lucky Strike. There is a photo focused tightly on the lower part of a man's face who is holding an unlit Lucky Strike between his lips and his fingers are bringing a lit match close to the cigarette. The headline identifies this moment as a "Big Meeting!". The text explains that when a cigarette becomes lit, "taste is the big thing" and that Lucky Strike are made for taste and taste alone. They also claim that "millions of smokers swear by Lucky Strike because of that taste." Full color 10" x 13" ad shows a man wearing a hat with a piece of the brim missing and the words "What I said was: Show me just one filter that won't take away the taste and I'll eat my hat"
Full color 9 1/4" x 12 1/2" ad has a picture of a man wearing a red shirt and a Fireman's Hat from Engine 1 with a large bite out of the front of the brim. He is holding a Lucky Strike cigarette and the ad has him saying "What I said was: Show me just one filter that won't take away the taste and I'll eat my hat!" This ad is larger than my scanner bed so the outer edges of the ad will not be visible in the scanned view. Full color 9 1/2" x 13" ad for their good-tasting Filter Cigarettes. The ad has a picture of Famous Tobacco Auctioneer L.A. Speed Riggs looking at the camera as he holds up two hats, each with a large bite taken out of them. The caption on the photo has him saying "Couple of fellows said: Show me a filter that really delivers taste and I'll eat my hat!". The ad headline claims that "New Lucky Strike Filters put back the taste others take away". This ad is larger than my scanner bed so the outer edges of the ad will not be visible in the scanned view. Full color 9 1/2" x 13" ad that is another one that has a man saying "Show me a filter that really delivers taste and I'll eat my hat" as he is standing there, Lucky Strike in mouth and a bite taken out of his straw hat. This ad headline claims that the "New Lucky Strike Filters put back the taste others take away". Below this it says "L.S./M.F.T. - Lucky Strike means fine tobacco...and new Lucky Strike means filter tip. So you get - unchanged - Lucky's famous fine-tobacco blend. And Lucky's filter tip actually enhances the taste". Full color 9 1/2" x 12" ad has a photo, from the nose up, of a Marching Band member who has a bite out of the brim of his marching hat. The ad has the familiar saying, "Show me a filter that really delivers taste and I'll eat my hat!" This ad is larger than my scanner bed so the outer edges of the ad will not be visible in the scanned view. Full color 9 1/2" x 13 1/2" ad for their Filter Cigarettes. The ad has a photo of an attractive blonde who is looking at the camera through the bite mark that has been taken from the brim of her brown hat that is covered with yellow roses. Clenched between her lips is a long-stemmed yellow rose and the ad caption has her saying "I said, 'Show me a filter cigarette that really delivers taste and I'll eat my hat!'". The text explains that L.S./M.F.T. has always stood for Fine Tobacco but now it also means Filter Tip. Full color 9 1/2" x 13" ad for their Filter Cigarettes. There is a picture of a lady of Oriental features wearing a reed hat that has a large bite out of the edge so that her right eye is visible to the reader. The headline has her saying "Show me a filter cigarette that really delivers taste and I'll eat my hat!". The text talks about the L.S./M.F.T. on each box and how it used to mean "Lucky Strike Means Fine Tobacco". Now they say it also means "Lucky Strike Means Filter Tip". Full color 10" x 13" ad with a Halloween theme. The ad features an attractive dark-haired lady wearing a witch's hat with a large bite taken out of the brim, right where her left eye, staring at the reader, can be seen. 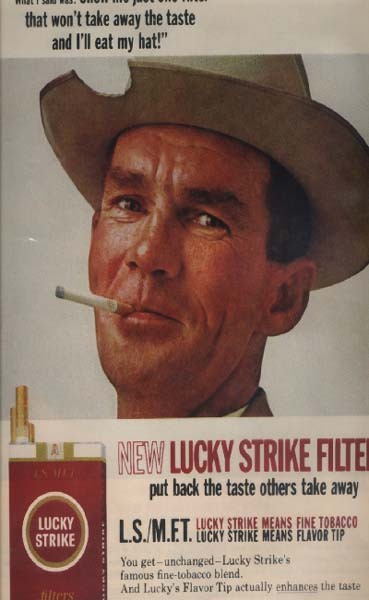 The ad headline says "Show me a filter cigarette that really delivers taste and I'll eat my hat" and it is claimed to be "The filter cigarette with fine tobacco". Full color 9 1/2" x 13 1/2" ad for their Filter Cigarettes. The ad has a picture of a man in a white suit and hat partially hidden by five oversize packs of Lucky Strike stating "Show me a filter cigarette that really delivers taste and I'll show you a Lucky Strike". The headline states with confidence that "A filter cigarette has to be Lucky to taste this good". Three color 9 1/2" x 12 1/2" ad for the Lucky Strike Green menthol cigarettes. The ad is printed on a green background and has a drawing of a hand holding up a pack of the cigarettes. The ad headline asks you to "Shake hands with L.S. Green. The finest menthol cigarette that you have ever seen". 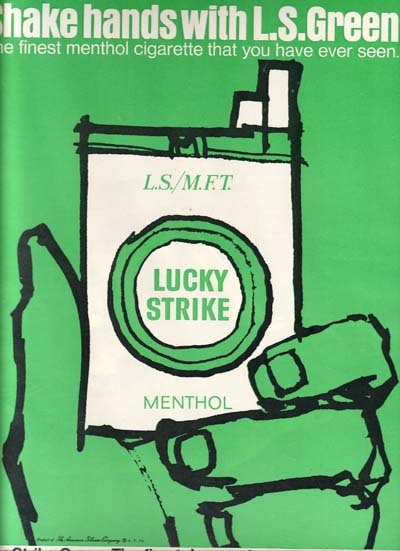 Underneath the drawing showing the pack of Lucky Strike Menthol cigarettes is the headline stating "Lucky Strike Green. The fine tobacco cigarette with menthol"
Full color 9 1/2" x 13 1/2" ad with a picture of a Southern gentleman in a white coat and a straw hat, smiling as he holds a lit Lucky Strike cigarette and says to us, "Show me a filter cigarette that really delivers taste and I'll show you a Lucky Strike". He is placed behind five oversized packs of Lucky Strike Filters, one slightly tilted as the bottom headline tells us that "A filter cigarette has to be Lucky to taste this good. The taste of Lucky - you've never had it so mild". Three color 10" x 13 3/4" ad for the ad that introduces Lucky Strike Menthol. 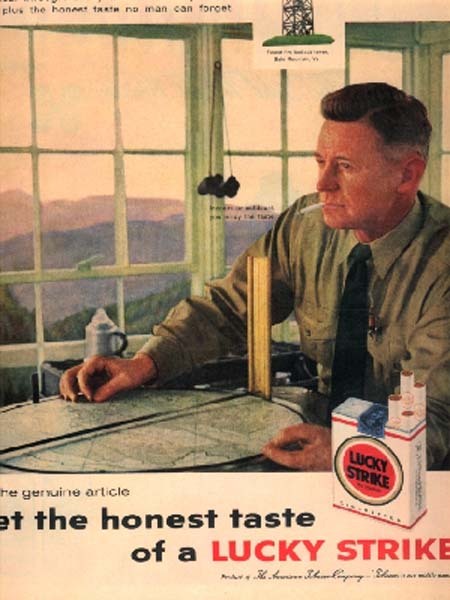 The ad has a drawing of a man who is lighting a cigarette from his pack of Lucky Strike Menthol with the headline that encourages us to "Shake hands with L. S. Green. The finest menthol cigarette that you have ever seen". The headline at the bottom of the at warns us that "Lucky Strike Menthol. The coolest flavor ever minted". 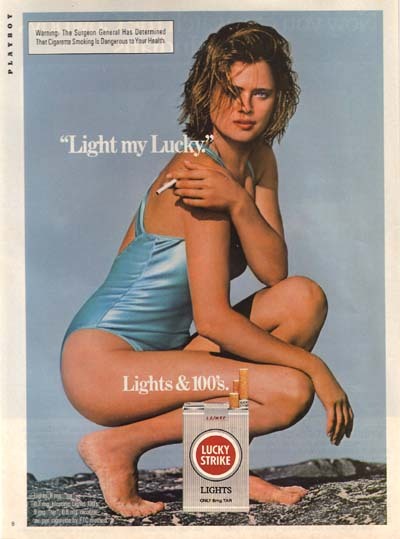 Full color 9 1/4" x 12 1/2" ad shows a pack of Lucky Strike being held upside down. The ad headline says "Lucky Strike introduces the Lucky Strike that doesn't taste like a Lucky Strike". The pack is being held to the camera, larger than life, with three cigarettes protruding a different amount, to give the illusion of conformity. Full color 9 1/2" x 13" ad that has a very large pack of Lucky Strike Filter 100's in the ad. 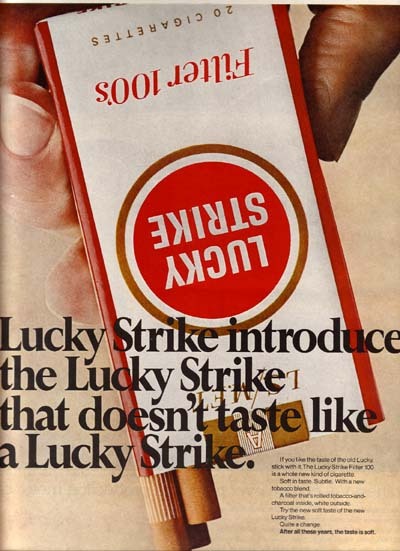 The headline of this ad claims that "Lucky Strike introduces the Lucky Strike that doesn't taste like a Lucky Strike" and you have to wonder just what they are saying. The text in the ad introduces "The Lucky Strike 100. A Lucky Strike that tastes soft for once. With a whole new blend of tobacco, next to a filter that's rolled tobacco and a charcoal inside, white outside. And a new taste: soft. If you still like the old Lucky, stick with it. The new Lucky Strike 100 is something else. The first Lucky Strike that doesn't taste like a Lucky Strike". Full color 9 3/4" x 13 1/2" ad that introduces us to the two new flavors of Lucky Strike's. The headline tells us that "Now there are 2 Lucky Strike's that don't taste like a Lucky Strike". There is a photo that shows a picture of the two new cigarette packs, the Lucky Strike Menthol 100's and the Lucky Strike Filter 100's. Below this picture there is two captions that describe the picture. Underneath the pack of Menthol the caption says "With. We figured there was only one way to make the soft taste of the new Lucky Filter 100 any softer-tasting. This is the result. The new Menthol 100". Under the right side it says "Without. This is the Lucky that broke the Lucky tradition and originated soft taste. It has everything our new Menthol 100 has. Except menthol, of course". Black and white 9 1/2" x 13 1/2" ad that discusses how Mild their tobacco really is. There is a picture of a lady with intense eyes holding the tobacco end of a Lucky Strike between her lips while the headline says "Lucky Filters: you don't even have to light it to like it." 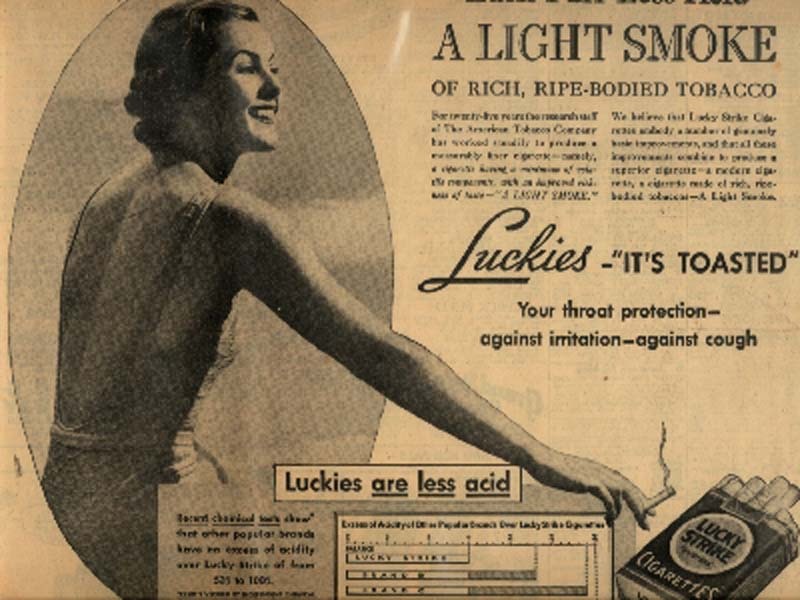 The text explains that if you "Draw on the tobacco end of a Lucky", as this lady is doing then "turn it around and light up" you will be amazed that the "same fine Lucky flavor comes through". It then mentions the Rolled Tobacco and Charcoal in the filter and shows a picture of a pack of the Filter 100 cigarettes. Full color 7 3/4" x 10 1/2" ad with a photo of a man standing apart from his friends to pull a Lucky Strike from it's pack. In the background are three other men taking a break from a recording session. The ad headlines claim that "Lucky Strikes again" and "New! It's filtered!" Full color 7 1/2" x 10 1/2" ad shows a young lady in a blue bathing suit squatting down on a rocky surface as she holds her cigarette next to her right shoulder, which is nice since we see her from the right-hand side. In the ad headline she is asking you, the reader, to "Light my Lucky" and, a little farther down, it offers "Lights & 100's". Full color 9" x 11 1/4" ad for theirLights. The ad has a photo of an attractive young lady wearing an orange dress, designer stockings and a jean jacket over her shoulders. She is looking toward the camera while she holds an unlit cigarette in her hand. The ad headline has her thinking "Light my Lucky".